Asheville Steel / Paragon PARA X OTF Front Opening Knife Tanto DLC Black Plain Blade (top knife), overall open length 9" with a 3 1/2" blade made of S30V. The handle is black anodized T6 aluminum. The Ashville Steel Paragon Para-X OTF automatic knife is a single action knife that is the next generation of the ATKO-10 with a rapid strong out the front fire with just the push of a button. Just press the button in and use the retracting lever to pull the blade back in to close the knife. The Para-X comes with a safety and pocket clip for tip down carry. 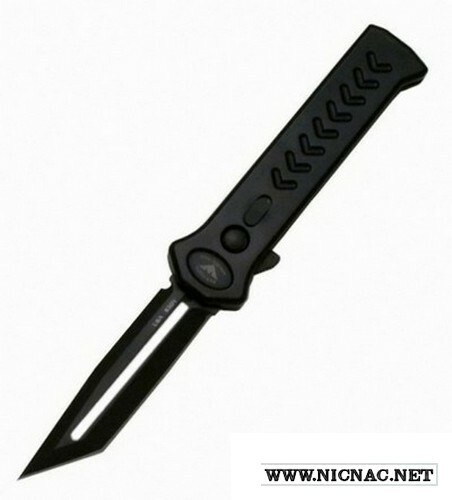 The overall open length is 8.75 inches with a 3.5 inch blade and closed is 5.19 inches. 4.2 ounces. Blade is made of S30V stainless steel and the handle is anodized 6061-T6 aluminum. Made in the USA.